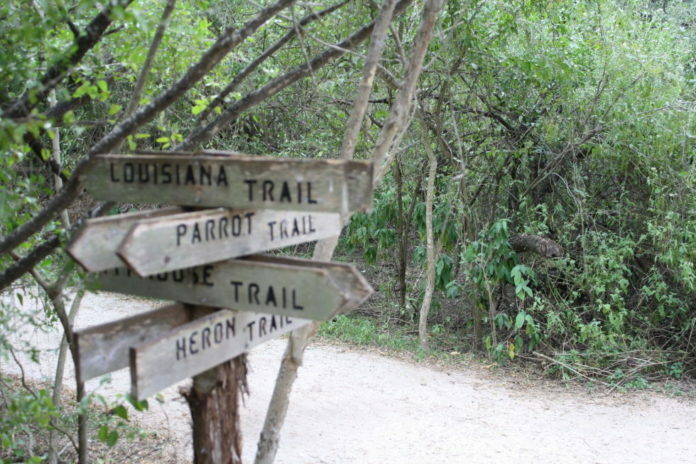 One of the Valley Nature Center's many trails. HARLINGEN — The challenge is to defeat not just Dallas, Houston, Austin and San Antonio, but to beat all 65 cities in 15 countries. They may have the edge in population, but here in the Rio Grande Valley, we’re brimming with a diversity of plant and animal species most places can’t match, and that could tip the competitive balance. City Nature Challenge 2018 will be held between April 27-30 and May 1-3, and participants — naturalists, scientists, adults and kids — are tasked with recording observations over the first period and uploading them to the free iNaturalist app. The second period will be for identifying all the plants and animals recorded in the first period. Whoever scores the highest total in both number of entries and diversity of species, wins. The game plan goes like this: The more people who sign up for the contest to represent the Valley, the more flora and fauna can be recorded. In this case, more is better. All observations uploaded to iNaturalist count, but the really good ones which count even more will be found in public areas, like municipal parks, rights-of-way and nature preserves. The observations need to be made of wild creatures, plant or animal. The data reaped from such a broad group of amateur naturalists will be used by real scientists to help better understand and preserve habitat and the creatures living there. Last year, Dallas-Fort Worth had the highest number of observations with 23,957, and Houston had the most different species with 2,419. “So we just need to get a lot of people involved, because what did it (for Dallas) was head count,” Lanoux said. “Lots of postings, lots of people involved, and if we can get the Valley mobilized for this, we’ve got the species both in plants and animals, butterflies and birds, you name it. “We can just take this thing and put the Rio Grande Valley on the map as an environmentally aware area,” he added. There’s no age limit to compete in the City Nature Challenge 2018, and if you have a smartphone or iPad or other tablet, or a PC or Mac with internet access, you can download iNaturalist and take a photograph and upload those digital photos to the app.